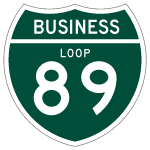 Interstate 89 used to have one business loop in Lebanon, New Hampshire. The lone Interstate business route in the Granite State looped through the city of Lebanon along side U.S. 4. The route was likely designated when I-89 was completed in 1968.1 Only one shield remained for the route in July 2000 and it was taken down by 2004.
Business Loop I-89 traveled a four mile route east from Exit 19 along Mechanic Street and parallel to the Mascoma River to the Park Street square in Downtown. Bank Street carried the rest of the loop back to I-89 at Exit 17. Yao, Gene J. “Business Interstate Routes.” Online posting. 07 Jul. 1998. misc.transport.road.